"Google recently announced it was going to put an 18 month upgrade requirement on any handset that wants to be Google-certified, meaning if you buy a handset today, you're guaranteed OS updates for 18 months." A different philosophy indeed! I understand why the hardware manufacturers don't want to push out updates so that people will buy new phones to get the new goodies, but that certainly isn't a very good model if you want to retain customers. 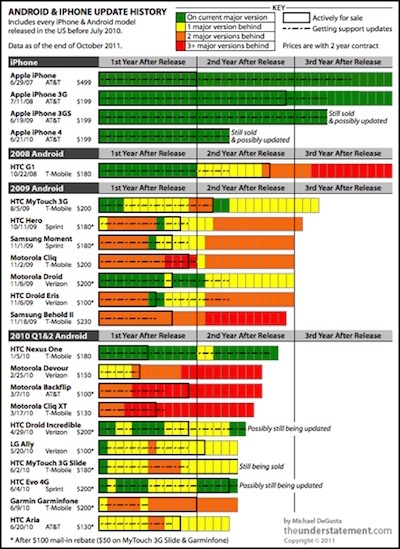 Apple is in the hardware business too, but they don't have a problem getting out updates that work on their older handsets, as evidenced by the chart above. Who do you think has the customer's best interests in mind? I know who my money is on, but what are your thoughts?